Human trafficking expert Siddharth Kara investigates the carpet industry in India. 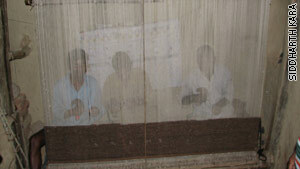 Siddharth Kara is in India examining the labor situation in carpet factories. Kara focused much of the week on the working conditions in the region. Uttar Pradesh, India -- The "Carpet Belt" of north India spreads west from the city of Allahabad, east through Bhadohi, over to Varanasi along the banks of the Ganga River. There are literally thousands of carpet looms concentrated in this region. Many are no more than small village huts with a single loom and a few workers inside. Others are large shacks that may posses up to twenty looms and thirty or more children. I have visited this region several times, and each time I find similar circumstances. The carpets are being woven in wretched conditions by bonded laborers (usually dalits or "untouchables") or even some trafficked boys as young as six years old. Bonded laborers are individuals who have borrowed money or assets for a wedding, funeral, medicine, home repair, or other reason, and are forcibly held in servitude to work off this loan at paltry wages and exploitive interest rates. Most prized by the carpet producers are young boys. Their nimble fingers are perfectly suited to carpet weaving, and being children, they are more easily coerced to work sixteen to eighteen hours a day. Young boys like the one I met at a shelter for rescued child trafficking victims near Allahabad, are locked inside carpet shacks in cramped quarters, beaten regularly, given meager allotments of food, suffer respiratory ailments from the high level of thread dust, and are force-fed stimulants to keep them working. They suffer deformed spines, malnutrition, vision ailments, and severe cuts from the sharp claw tool that is used to pull the thread down the loom. The young boy said he was told wild dogs were in the forest outside the loom and would eat him if he tried to escape. He was also told that if anyone ever knocked on the door, he and the other boys should not say a word or the guards would kill them, and their families. Exploiting children in this way allows carpet producers to keep profits up and prices down. Carpets made in this region are routinely exported to the EU, U.S., and beyond. A few brave souls work in this area and put their lives on the line to raid the carpet shacks and free the children. The shacks are almost always guarded by armed men. There is significant danger in this work, and I know more than one person who has been severely injured. In my most recent trip to the region, I also met my second child trafficker - "Sanjay." Sanjay claims he is routinely approached by parents in search of a deal for their children. He says he takes the children from villages throughout the Carpet Belt to Varanasi, where an agent allocates the boys to carpet looms and the girls to brothels. He said he is paid between $90 and $100 for boys and $150 or more for girls. Of this sum, Sanjay pays about 20% back to the parents, along with the promise of remittances from future earnings. Meeting Sanjay was a surreal experience. On the one hand, I am a researcher trying to learn as much as possible by being impartial and keeping Sanjay relaxed and willing to talk. On the other hand, I have met boys and girls who are victims of levels of abuse that are disturbing beyond measure. In the end, I left my conversation with Sanjay troubled by the same thought I had after meeting my first child trafficker - just who is the greater criminal here? Is it a callous opportunist like Sanjay, or is it a system where such intense levels of poverty persist, that millions are forced to make desperate calculations of selling one child, in order to save their others?